The main objective of this project is to provide warm clothing to men, women and children for the cold winter months. 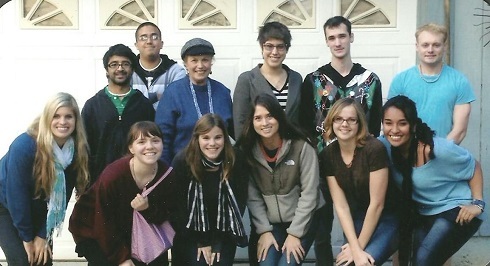 SHARE interns collect clothing and bring the items to local shelters. The coat drive was highly successful, bringing in well over 100 coats and several boxes of miscellaneous other clothing items that were donated to local homeless shelters. The SHARE Institute collected and donated several bags of clothing to men and women who are trying to work their way out of poverty and homelessness. These men and women earn minimum wage and are extremely grateful for the clothing and general assistance. To bring aid this winter to the needy and homeless in the Sacramento area, the interns of the Share Institute organized a coat drive held at American River College. From October 16-31, professors and students were urged to take action and donate coats in all shapes and sizes. For the event posters, flyers and boxes were distributed campus-wide. In response, dozens of coats and jackets for men, women and children were donated. All coats that are collected will benefit working poor families via the Salvation Army and St. John’s Shelter. The SHARE Institute has collected and donated several bags of clothing to men who are trying to work their way out of street poverty and homelessness. These men are extremely grateful for the clothing they receive, especially during the winter months. Several boxes of clothing and hygiene products were collected and given to Salvadoran Enterprises for Women (SEW), an organization that seeks to economically empower poor women in El Salvador. The president of SEW, Ms. Lorena Cuellar, visited the SHARE Institute to pick up the items and deliver them to El Salvador where they will be distributed to poor rural women. The project is one example of how the SHARE interns’ work involves both local and global projects. The SHARE interns, once again, collected many bags of donated clothing to be distributed to WEAVE, the SHARE Institute’s domestic violence program, and the Safe Children’s Center for abused street children in Aden, Yemen. The SHARE Institute made care packages and collected winter clothing for homeless Sacramento teens. Items collected for the care packages included packaged snack sized food items, backpacks, phone cards, toiletries, and clean socks. Bigger items collected included sleeping bags, umbrellas, jackets, gloves, hats, and other warm winter clothing.